In 1876, Alexander Graham Bell uttered the words that would inaugurate a new era in human communication: "Mr. Watson, come here, I want to see you." Bell was speaking through his new invention: the telephone. Though his name is the first to be associated with this now ubiquitous device, Bell was not working in a vacuum or entirely on his own. The second half of the 19th century was a time of great innovation, during which many people were experimenting with various designs for machines to enable human communication over great distances. Bell was simply the first to win a patent. 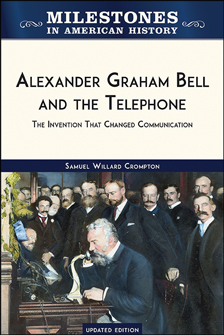 Alexander Graham Bell and the Telephone, Updated Edition tells the story of the man who invented the telephone, the people who helped him, and the changes that came about because of one of the greatest inventions of all time. Bolstered by extensive photographs, this curriculum-based eBook is ideal for students writing reports. Samuel Willard Crompton is a historian and biographer who lives in the Berkshire Hills of western Massachusetts. He has twice served as a Writing Fellow for Oxford University Press in its production of the 24-volume American National Biography. Crompton teaches history at Holyoke Community College in Massachusetts.